How to Prevent DEADLY Consequences to You and Your Patient! Doctors and other medical professionals are there to help – to heal and not to harm their patients. All too often – inadvertently the opposite happens – the patient acquires an infection from the doctor or nurse attending to their problem, and not too infrequently the patient infects the attending medical professional – even with a deadly virus – like the HIV virus. Hospital acquired infections are a serious problem all over the world – the Centers for Disease Control and Prevention estimate that roughly 1.7 million hospital-associated infections occurs and cause or contribute to 99,000 deaths in the United States of America each year! The Club leader will have to do a bit of research before the meeting. Project 00 A: How to Hygienically Wash one’s Hand. See: WHO page 156 – follow the steps meticulously! Project 00 B: How to Apply Antiseptic Hand Rub. See: WHO page 155 – follow the steps meticulously! Project 00 C: How to Put on Clean Glove. See: WHO page 141 – follow the steps meticulously! Gloves are the most common type of personal protective equipment (PPE). Gloves are considered a barrier protecting both you and your patient from the transfer of harmful microorganisms. Always use gloves when you work on a patient. Hygienically prepare your hands before gloving and clean your hands again after removing the gloves and before moving on to your next patient. Gloves are absolutely essential when you have an existing cut or small wound on your own hand and when you are touching any bodily fluid/secretion/excretion. The operating theater can be a messy/bloody/gutsy place. Surgeons often wear waterproof boots as a protective measure from contamination with blood, puss, amniotic fluid etc. Boots should protect your feet. Steel toes are best for this purpose. It should be water-proof, flexible and they must be exactly the right size. They should also be able to protect you against cold weather and punctures. The soles of your boots must provide good traction to prevent you from slipping and sliding down slopes. Shoe covers are important as they help maintain a sanitary environment by eliminating tracked-in dirt and microbes and they protect the wearer from accidental spills and bodily fluids. Always use shoe covers when entering the operating room or Intensive Care Unit. Alternatively use dedicated surgical boots or shoes. Even clean recently washed hair is contaminated with loads of bacteria. 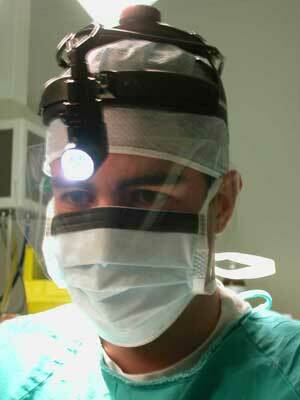 The surgical cap minimizes the risk of hair falling into the sterile area during surgery. Ensure that all your hair is covered by the surgical cap before proceeding with scrubbing for surgery! A face masks is worn as a barrier to protect the patient against the transfer of harmful microorganisms present in the healthcare professional’s saliva, nasal discharge and facial hair, and to protect the healthcare professional from being infected by microorganisms present in puss, blood, other body fluids, secretions (e.g. saliva) or excretions (e.g. feces) by the patient. Medical professionals should wear a mask and eye protection or a visor (face shield) to protect mucous membranes of the eyes, nose and mouth during procedures and patient-care activities that are likely to cause splashes or sprays of blood, body fluids, secretions or excretions. Masks should be worn at all times in restricted areas of the Operating Room – where sterile supplies are opened and at scrub sinks. Masks with face shields or masks and protective eyewear are required whenever splash, spray or droplets of blood or other potentially infectious materials may be generated. Some surgical procedures may become really ‘messy’ – thus the surgeon needs to protect him/herself by wearing a waterproof apron. Surgical procedures where a lot of bleeding of spill of bodily fluids like amniotic fluid e.g. during a Caesarian section are examples where an apron is needed. Surgical gowns are considered one of the most important protective items during surgical procedures. Sterile surgical gowns play an essential role in maintaining aseptic conditions by blocking the transfer of harmful microorganisms and chemicals to and from the patient, and reducing the transfer of bacteria from the skin of the surgical staff to the air in the operating room. Wearing surgical gowns and other medical apparel (e.g. surgical masks, gloves, etc.) is of utmost importance as there will always be microorganisms present on or in the human skin, even after conducting strict hygienic and surgical scrubbing procedures. The purpose of surgical gowns and other protective clothing is not only to keep bacteria from entering surgical wounds, but to also protect the surgical staff from bodily fluids, secretions or excretions like blood, urine, saline, or chemicals used and during surgical procedures. What if I don’t have soap and clean, running water? Important Note: Hand sanitizers are not effective when hands are visibly dirty. Stop the spread of germs that can make you and others sick! Influenza (flu) and other serious respiratory illnesses like respiratory syncytial virus (RSV), whooping cough, and severe acute respiratory syndrome (SARS) are spread by cough, sneezing, or unclean hands. **Cover your mouth and nose with a tissue when you cough or sneeze. If you don’t have a tissue, cough or sneeze into your upper sleeve or elbow, not your hands. You may be asked to put on a facemask to protect others. Wash your hands often with soap and warm water for 20 seconds. **More and more medical professionals recommend that one gets into a habit of coughing/sneezing into one’s armpit (axilla) or the inside of your elbow (in culture where greeting by handshaking hands is the acceptable thing to do). Looking forward to Module 3? Prepare by reviewing the Respiratory System in the Apprentice Doctor CD-ROM in your Apprentice Doctor Kit! Trust you enjoyed this Apprentice Doctor Module. Your feedback will be appreciated!